The concrete legs of the nursery tables are dropped onto the site. On the morning of Day 2, the sun finally comes out. Austin and his team construct the first of the nursery tables. Raised up, the corals will be safe from Crown of Thorns Starfish. A healthy colony ready for the nursery. Healthy corals were hard to find on a reef were many had died. The coral gardener presents wild corals ready for the nursery. Austin and his team attach the corals to the nursery table. The author himself is visiting the coral nursery. But coral gardening has changed since Austin first started. In early 2016 global water temperatures rose dramatically. Reefs were damaged across the world. Once flourishing sites that Austin had worked on became completely bleached, and died. These spikes in temperature are likely to be the norm from now on. So Austin only wants to plant corals that he knows can withstand hotter water without bleaching. He calls them ‘super corals’. The waters off the Beach House reached 34 degrees Celsius in early 2016. That’s three or four degrees higher than bleaching temperature for most corals around the world. Which means that whatever has survived here may be some of the most heat-resistant coral on the planet. In a year or so, these super corals will be trimmed and the second-generation corals put back onto the reef. From there everything is in Mother Nature’s hands. The corals will grow and eventually spawn, releasing their offspring into the water to create new colonies of heat-resistant corals as far as the tide will take them. But why not just leave these ‘super corals’ where they are? 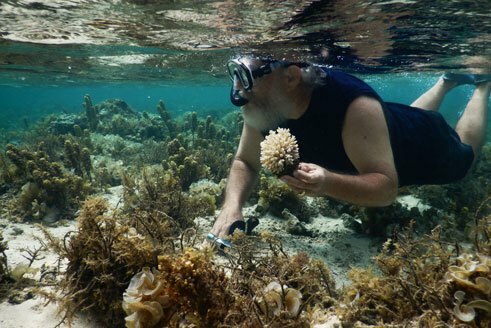 Sadly, rising water temperatures are not the only threat to corals. With its natural predators overfished, the coral-eating Crown of Thorns Starfish runs rampant across Fiji’s reefs. 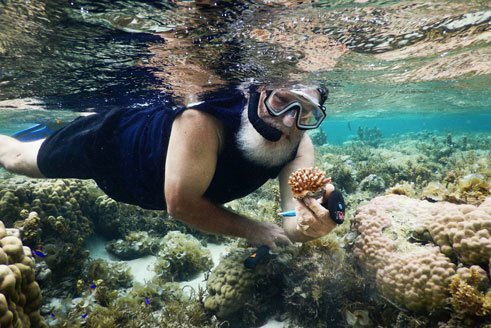 They eat one fist-sized coral every day. “Every bleaching resistant colony that we bring into the nursery has a much better chance of surviving under care than it does in the wild,” says Austin. But Austin knows that coral gardening alone is not enough. If fish are to return to the reef they need protection from overfishing. So locally managed marine areas and ‘no take’ zones are vital. But if you ask local villages not to catch fish, where do they get their protein? Austin is working on that too – his ‘Happy Chickens for Healthy Reefs’ project trains people in poultry farming. So far he has hatched and distributed over 15,000 baby chicks.